Belchin village, Temple of "St. Petka"
The medieval church of "Saint Petka" is a national monument of the artistic culture of the 1st class. Since many centuries, it has been an integral part of the "Saint Spass" hill above the village of Belchin. The first data from the scientific research indicate that it underwent several stages of construction and re-construction. In its present appearance, the church was built in the 17th century upon the foundations of another temple dating back to the 13th - 14th century. The temple's dimensions are 12 by 6 meters, and once it had drawings. The inner walls were painted by an artist. Traces from the drawings were found during the archeological excavations in 2007. Later on it underwent a cataclysm of a kind which is still unknown. During the time of the Bulgarian Renaissance the prayer hall was enlarged to its present day size. However, the vault of stone was replaced by one made of wood. "Saint Petka" is a one-nave church with a vault in the form of half a cylinder and a roof with two slopes. We infer the time when the building work was done based on the similarities with other such churches, the architecture, and the techniques, as well as on the superscriptions on the icons. We could place it within the timeframe of the 16th - early 17th c. There are two places where it is situated upon graves of an earlier period. It was found out that two male individuals had been buried there lying on their backs on a thick wooden grille. Big forged iron cotters remain from it. In the grave under the north-east corner of the church, a grave gift is placed by the body - a small ceramic bowl with graphic decorations on it. Similar rituals and gifts are known from the necropolis at the Belyova Church in the town of Samokov related to the 13th-14th c. It has been found out that there was intensive church building activity in that period - the process is known as the creation of the so called "Sofia Holy Woods". Secondarily, during the epoch of the Bulgarian national renaissance, a narthex was constructed as a second floor, and a porch was made on the first floor. This extension of the sacred space by pulling down the western fa?ade and making a constructive link to the narthex is typical for this geographic area and for this epoch. The building technique is typical - stone masonry work of river stones and broken stones on mortar, and use of construction wooden structures called santraches. The temple has exceptional artistic value. The art specialists date back the iconographic decorations to various periods. 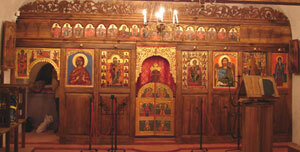 The oldest icons are from the beginning and from the middle of the 17th century. The icon in the crypt and some of the remaining icons were painted in 1653. These works of art are rare artistic examples - equal to the best ones in the country, created during the heyday of the national renaissance period. The church donor's superscription on the icon of the Mother of God reads: "Remember, o Lord, the servants of God Hadji Yankul and his wife! Stephen, the son of Stoichina. 1653." We come across the name of Hadji Yankul on other church donors' superscriptions. 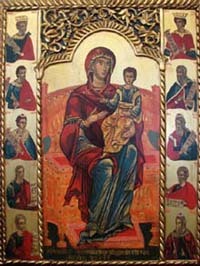 In fact, the most valuable icon of "The holy Mother of God with the Infant" is exhibited in the Crypt (Temple-Monument Alexander Nevski) of the National Art Gallery in the immediate proximity of the icons from Veliko Turnovo. The church survived together with the population through the difficult and meager years of mutinies in the Ottoman Empire when very often churches and monasteries used to be plundered and put on fire. 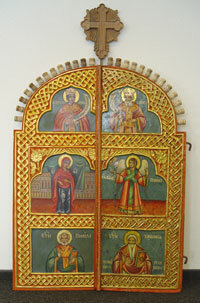 On old pictures of the iconostasis we can see icons from various centuries which are a proof that the local people continued in their zeal to take care of their church. During the 30's and 40's of the 20th century, professor Vassil Zahariev made research on the icons, the wood carving decorations, and the other valuable things of the church giving a detailed description of everything in the temple. Very interesting is the footage taken by prof. V. Angelov in 1962 which is kept in the archives of the Institute of Art Science with the Bulgarian National Academy. It shows that the rich altar was well preserved and the villagers took great care of the temple. In 1967, the temple underwent complete restoration. Regretfully, later on the temple began gradually to get destroyed, the icons, the wood carvings, and the other valuables being transferred to the new church which started functioning in the village in 1887, to various museums, private collections, etc. This made the future of the temple unclear. The worst time for the church was the period from 1991 to 2005 when treasure seekers made a hole in the roof and dug around the king's throne, and the temple was half destroyed. The condition of the church in the last decade of the past century brought about to its roof falling down in ruins about ten years ago as well as a part of its walls. Also, some of the church furnishings were significantly damaged. This made it necessary to begin an overall restoration of the temple, preserving to the maximum extent possible its original appearance and the remains of the original. In the research, planning, and restoration work on the complex became involved professors, researchers, art experts, museum workers as well as specialists - architects, artists, restorers, archeologists, ethnologists, builders, and others. Near the church a bell tower was erected. 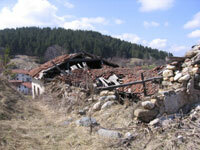 At the foot of it, was built an ethnographic museum house which is a branch of the museum of the town of Samokov. When doing the restoration work, the space was cleared and the stone crosses on the northern side were fixed. All of these are monuments of high artistic and historic value.